Here are 2 more ways to stockpile medical supplies. Number Three Order supplies the first day the script is available to reorder-even if you still have supplies left. Note: This is the reason I now have extra boxes of strips in my cabinet. The goal is to get your new supply of strips when you still have a box (or two!) in reserve. If you're faithful with this, you'll build up a supply. Call your insurance company and ask when you can reorder. I know, you probably dread the thought of calling them. I get it! But I've actually found them very helpful when trying to figure this out. AND it's important because every policy is different. Some insurance companies require that you wait until 60% of your supply is used up. Ours is a little different. We get a 90-day supply and have to wait 68 days before another order will go through. So once I get an order, I calculate 69 days forward and mark my calendar. When that day arrives, reordering is my top priority! Getting your order a few days sooner can make a HUGE difference when building a stockpile. Especially if you do this faithfully with every order. You'll have extra strips in no time. Number Four Get free meters whenever possible. They usually come with at least 10 test strips. Plus, you'll have a backup meter if there's ever a problem with your main one. Just this week CVS has a freebie! They have the Accu-Chek Nano on sale for $9.99. In the Sunday paper, there was a coupon for $10 off the exact same meter. Totally free! Sometimes your doctor will have samples of meters as well. It never hurts to ask. Tell your friends and family to keep their eyes out as well. I've also heard of free deals on insulin, but I don't have any firsthand experience with that. Please share in the comments if you have tips on this. What do you need to stock up on? Call your insurance company if necessary and make a "reorder plan." Problems do come up and you'll be thankful you're prepared! Next week is the final part of this series: How To Manage Your Stockpile. Matthew gets 300 test strips a month and sometimes it's not enough. When you take into account "normal" testing" plus highs, lows, activity, basal testing, sickness...it's a wonder we don't run out more often! For nearly a year, I bought extra strips on Amazon--those suckers are expensive! We'd go through one $50 tube in 5 days. Thankfully, I've learned how to play the game. If you have a newly diagnosed child, I hope these tips will help. I'll share 2 tips today and 2 more in my next post. Number One How the prescription is written can change everything. The wording is sometimes very important. Example A When our prescrition was written for "300 strips per month," it caused problems with our mail order company. Our script must say "300 strips per month. Tests up to 10 times a day." If that "testing part" isn't in there, the mail order company balks and they delay. Example B Matthew uses Omnipod and we never run out of pods. Why? Because of the way the prescription is written. Matthew changes his pod every 3 days. The prescription is written that he changes the pod every 2 days. We never run out of pods and it's a huge blessing. Talk with your CDE about this if you're having trouble. They should be willing to help. And if you'e not getting the answers you need, ask another D-Mom for their input. Those who have been in the trenches longer really do understand the system and will happily share info. Number Two Get a Quantity Override Form if necessary. 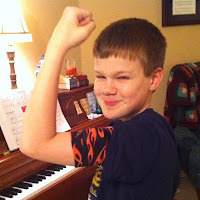 When Matthew was first diagnosed, the pharmacy told me "200 strips is all we can give you. Your insurance company won't let you have more." Wrong! Yes, many insurance companies limit the number of test strips (or other items) that you can have each month, BUT in many cases, you can have your doctor's office fill out a Quantity Override Form to increase your monthly limit. One Note If you have a Quantity Override Form, find out how long it lasts. Our insurance company requires a new form each year, but I didn't realize that until the date passed. We had to wait weeks to go through the approval process again! Mark your calendar and get that form faxed in early so there's no lapse in supplies. Next week I'll share my number one tip for stockpiling. It's the only reason I finally have extra boxes of strips in my cabinet. I'm so thankful for the blessing of insulin. It's still difficult to believe that Matthew would die without it. Truthfully, that's one of my biggest fears: What if he doesn't have access to the supplies that keep him alive? It's a scary thought and a constant prayer of mine. So should you stockpile medical supplies? Creating a stockpile of medical supplies should be a top priority. I'm not saying you need to have 12 spare bottles of insulin, but you should always have at least one month of supplies in reserve. Always. I had trouble ordering test strips in April. It took about 2 weeks to get it straightened out. The only reason we made it through that period was because I had a few boxes of test strips in reserve. We've used this mail order company for years and I've never had a problem, but guess what? I had problems ordering again this month! Thankfully, we still had a couple boxes of strips. You never know when problems will arise. Be prepared! We know a family who has a daughter with Type 1. Last year they had trouble with their insurance company (it happens all too often!) and I was able to give them a few supplies until everything was worked out. It was a blessing to have spare supplies to share! If you don't have a stockpile of supplies, it's time to make a game plan. My next post will have some tips to help you get started. Diabetes is exhausting. And saying goodbye to my favorite furry friend is heartbreaking. Thankfully, I had a great book to help me escape. Harvest House Publishers sent me My Stubborn Heart by Becky Wade in exchange for my honest review. I LOVED this book. It's a contemporary Christian Romance and the prelude was so cute that I was drawn in before I finished the first paragraph. No joke! Of course, I knew "boy and girl" would get together, but I was completely intrigued with the story line and the way it was written. Very creative! I don't like reviews that give the plot away, but I will say that the heroine, Kate, is so cute. Quite frankly, I'd love to be friends with her. She's funny, brave and obedient to God, even when things get tough. She's praying for God to give her a husband, but He's not answering that prayer just yet. When Matt enters the picture, you know somethings up. He's battling a lot of emotional scars, but you'll quickly find yourself cheering him on to a relationship with Kate. Of course, things are never as easy as they seem and you'll find some unexpected twists that'll keep you guessing. If you're looking for a great summer read, don't miss this book. It'll put a smile on your face and you might even chuckle out loud like I did! Just the escape I needed. I wish Becky Wade would write faster. Twister brought joy and laughter to our lives for 14 years. She was a huge blessing! I believe with all my heart that God has a special plan for animals and we'll get to see her again. I hoped to be up at 6am, have my quiet time and workout. I even set everything out last night so I'd be all ready to go. But last night was a long night. Between checking Matthew and caring for our 14-year-old dog, Twister--who is not doing well at all--I was exhausted. I reset the alarm and opted to sleep in. There was a time when I would have felt guilty. For not getting up early and being productive. But this morning, I felt like God was speaking to my heart: I know you were up last night. I know you're up every night and I understand. You're willing to sacrifice sleep to care for Matthew. And Twister. That's why I chose you. Go rest some more. I still had my quiet time. Just a little later. The workout hasn't happened yet, but the day isn't over. Twister asleep on my book! 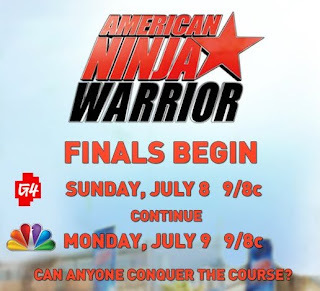 Have you been watching American Ninja Warrior? Matthew loves this show! At first, he was bummed because he didn't think anyone with Type 1 Diabetes would be a contestant. But then he saw young man named Kyle. He's the first Type 1 to qualify for the show. And guess what? He's made it to finals! Not only is Kyle a great athlete, he's also a straight-A student at San Diego State University studying physical therapy. To top it all off---he's active in his church. Love that! Grab your Type 1 Kid and watch American Ninja Warrior this weekend. I'm sure you'll be inspired. And be sure to visit Kerri's blog at Six Until Me. She has a great interview with Kyle on her website! The first meal I cooked for Matthew after he was diagnosed with diabetes left me shaking in my Texas boots! It was his favorite: tortellini. (I know---clearly I had lost my mind!) Our CDE suggested we stick with easy meals at first and I should have listened. By the time I cooked the pasta, calculated the carbs, measured it out, checked his BG and gave the shot of insulin, I was a nervous wreck! It was the most stressful meal I had ever made in my life!! We're 2 years into Type 1 now and while we're definitely in a groove, I want to know how other families handle meals. Here's a sneak peak into what dinner looks like around here. About 15 minutes before dinner, I'll call Matthew to check his sugar. He'll decide how much he wants to eat (we write that down) and he'll count the carbs. He'll bolus the full amount. Sometimes he'll stay and help me dish everything up. He might measure out peas or fruit. Sometimes I do all of it..
After eating dinner, occasionally he'll want more food. He just boluses again at that point, but most of the time it's done up front. If his sugar is high, I'll try to delay dinner. If he's low, he might wait and bolus right as we sit down to eat. In these situations, I love for him to pre-bolus about 50 carbs. Then he'll fix his plate and keep track as he eats more. He'll keep bolusing as necessary. When eating at home, we try to be as exact as possible with the carb count. We weigh or measure every single bite that Matthew eats. I find this gives us more freedom when we eat out. We just SWAG and feel more relaxed about it. Please share what dinner looks like at your house. I'd love to see other perspectives and get some tips! And if you decide to write your own post, let me know and I'll link to you. Vacation Bible School and Diabetes--Progress! This was Matthew's 3rd year having diabetes at Vacation Bible School. The progress I've seen in him over the past few years is nothing short of amazing. Matthew is such a smart kid. Fabulous grades, avid reader, and---perhaps best of all---he's a rule follower. Very important when you have diabetes! BUT, before you jump to the conclusion that I have the perfect child, you need to know that Matthew is much more interested in robots than diabetes. He would rather play Minecraft than count carbs. The child would rather do anything besides think about diabetes! Which is why it's such a blessing to see him taking over more of his diabetes management. I would hunt Matthew down at snack time. Whenever I asked how many carbs he thought it was, he would say "10" every single time. He wasn't thinking about the carbs at all, "10" was just the magic number for him. I would help him get a more accurate count, give him a shot and leave. We would start each morning with a visit the church kitchen. Once we found out what the snack would be, we'd discuss it, make a plan, and he was on his own for the rest of the morning. He had his phone and could call me if he needed to, but he never did. He was amazing. Even the day his group got a different snack than what was planned! Made a good carb guess. Bolused. His BG was right where it should have been at lunchtime. I couldn't have done better myself! Some days I think he'll never learn to take over his diabetes care, but clearly he's getting it and I'm so grateful. When Matthew was diagnosed with diabetes, I worried about giving him shots. I worried about pricking his finger. I worried about counting carbs and giving the correct amount of insulin at every meal. But one thing I didn't worry about? The cost of diabetes. I had no idea that this disease would be so expensive. So what's a D-Mom to do? Try to save as much as money as you can elsewhere. Several months ago, I discovered a great website that's helped me build a budget, save money and get myself a little better organized. Financially, physically, and around the home . Best of all? It's just an ordinary website with no fees. Years ago I did the Grocery Game, but there was a monthly charge and I was tired of paying to save money. The website is called Money Saving Mom and it's truly fantastic. You'll find tips on grocery store sales. Drugstore deals. Every week there are links to several freebies that you can sign up for. There are even tons of great recipes. Just this week on her website, I discover that the Apple Store has FREE Apple Camp for kids ages 8-12. They learn to make movies! Matthew's going to love it! Many of the classes are filling up, but you still might snag a spot. So pop over and visit Crystal, from Money Saving Mom. It'll be worth it! FYI...I have no connection with her. I just love the website! Do you have a favorite website that helps you pinch pennies? I'd love to hear about it in the comment section. Vacation Bible School. Swimming lessons. Diabetes Camp. For the entire month of June, we have only ONE free day. All the activities are great, but truthfully June is so busy that "fun" isn't how I would describe it. "Hectic" might be a better word, but "hectic" isn't the kind of summer I long for. This year, I just want to enjoy time together, so we made a list of fun things to do. Each week we pick an idea and get busy! One of the best things we've done so far is visit a local mosaic shop to get crafty. Look at this great sword that Matthew made! Great sword, but he doesn't look very fierce with that big smile! And I made a gecko! It was a great way to spend Kevin's birthday and we created some fun memories. It's not too late to start your own Summer Fun List. Jot down some thoughts. Ask your kids for ideas and then be sure to share in the comments. I'd love to hear what you're planning! And I'll probably add them to my list! Tuesday Tip of the Day returns. Don't you hate it when you chop onions and your eyes start to sting? 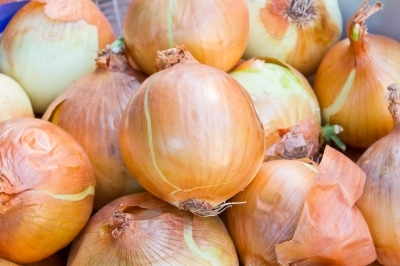 Storing onions in the refrigerator never worked for me. But finally, after about 15 years, I figured out a solution! Chew gum while you chop up that onion. Your eyes won't burn! Since I'm writing about onions, I thought you might enjoy a recipe. For D-Moms with a gram scale, I've included the weights. Our carb count is listed below. 1. Cook noodles for 10 minutes. 2. In skillet, mix together the chicken broth and flour. Slowly add in the remaining ingredients, except for the cheese. 3. When noodles are ready, put everything into a greased glass pan. 5. Bake at 350 for 5-10 minutes or until cheese is melted. This recipe makes 8 servings and each serving is about 22 carbs, depending on your particular ingredients. Enjoy! 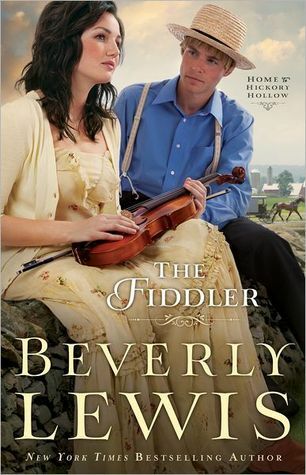 Bethany House Publishers sent me a free copy of The Fiddler by Beverly Lewis, in exchange for my honest review. And honestly--I loved it! Beverly Lewis never disappoints! This story begins with an accidental meeting. Amelia DeVries is an acclaimed violinist and also a "secret" country music fiddler. She gets caught in a storm and meets Michael Hostetler, a young Amish man struggling with the decision to be baptized into the Amish faith or "go fancy." Both characters are facing the same dilemma. They want to respect and "obey" their parents, but at the same time, Amelia and Michael have their own dreams that are very different from what their parents expect. If you've never read Amish fiction, the Home to Hickory Hollow series would be a perfect place to start. I enjoyed reading about the Amish lifestyle with a contemporary twist. And since I'm a piano teacher, I loved the music aspect as well. Book 2, The Bridesmaid, comes out in September. It's definitely on my wishlist! I meant to do a school-year wrap up. Honestly I did! It was, however, a great school year for Matthew! Another year with fabulous grades and he won the spelling bee again. He even got to dress up like Leonardo DaVinci. I need to post a picture!! In the area of diabetes, he was amazing! You might remember that there's no nurse at his school. But this year was "transition year" for Matthew and by the end of the school year, he was handling everything on his own. (During school hours). It was a rare day that he hard to call for help. It was a big accomplishment. Now....6th grade, here we come! If you're a strawberry lover like me, then you're going to love this storage tip! First, get a plastic container or glass bowl that has a lid. Line the bottom and sides of the container with paper towels. Toss the unwashed strawberries into the bowl and cover them with additional paper towels. Make sure the berries are COMPLETELY covered up with the paper towels. You should not see the strawberries at this point. Put the lid on the bowl and place the container in the fridge. Those strawberries will last for AT LEAST a week. When you notice that the paper towels are getting damp, just replace them with dry paper towels and you're all set. I mentioned back in November that I was embarking on a big project: memorizing the entire chapter of Romans 8. It was part of a challenge with the ladies from Do Not Depart. Well, here I am, about 5 months later and I did it! So many times, I wanted to give up, but I'm so glad I didn't. It feels really good to have spent time on something truly worthwhile. There's another challenge beginning in a few weeks. Won't you join me? You only memorized 2 verses each week. Who has time to blog when there's Pinterest? You know how homemade cookies look so....homemade? That is NOT the case with the cookie I'm sharing with you today. My boys LOVE the way these taste, but honestly, I love how they look. Just look at these pretty cookies! Perfect if you need to bake something for school or church or whatever. I'm betting you'll find any excuse to whip up these babies!! One warning: They're not healthy. So don't freak out when you see how much oil is in the recipe. The goal is a pretty and wonderful tasting cookie. Keep that in mind. For those of you who use a gram scale, I'm including all the weights for you. Hope that makes the recipe even sweeter for you! Carb count information at the bottom. Get a LARGE bowl. This recipe makes about 70 cookies! Mix all ingredients. Keep scooping up the flour in the bottom of the bowl. It will a while to get it all mixed in, just keep at it! Drop small amounts of dough on the cookie sheet. Smaller amounts of dough will give you a prettier cookie. Bake for about 9 minutes. Don't bake too long and don't worry if they look a touch underdone. They are fine. Check because your oven make cook different. Let cookies cool for a few minutes. They will look very puffy at first, but will "settle down" within a few minutes. Transfer to a cooling rack. Tip: I prepare 3 cookie pans with foil. While pan #1 is in the oven, I get pan #2 ready with dough. Cookie pan #1 comes out of the oven to cool. Pan #2 goes in oven to Bake. Now I get pan #3 ready. The goal is to make sure you put dough on a cool cookie sheet. Very important! Carb Info: Your ingredients may be slightly different, but I'll share my carb count information. If you follow the directions, your cookies should be similar. For me, one batch of dough is 938 carbs. I make small cookies, so I usually get about 70 cookies. That makes each cookie about 13 carbs. Of course, some are bigger and some are smaller. You know the routine! The carb factor is .60 Hope that helps. Now, go make your family happy with some yummy cookies! Kevin and I love to watch The Biggest Loser. Although truthfully, the contestants are so nasty this year that it isn't as good. On the show, they were weighing people, but all I saw was Matthew's blood sugar. A 234 popped up and I realized that I didn't think of Matthew's BG. Oh, I still think about diabetes a lot---that's a requirement of being a d-mom. It's the first thing I think of in the morning and the last thing I pray about at night. I've accepted that part of my life. But at least I can enjoy a show with my husband and not think about it for while. A Cupcake: What would you have done? Last Wednesday, Matthew had been running high all day. Mid 200's at every check. Pretty rare for him, but I wasn't too concerned. That night we went to church and at the end, they passed out cupcakes. Matthew said he wanted to eat his in the car on the way home. We checked his BG and he was 362. Not ideal for a cupcake. But thankfully, Matthew stepped right up and said he didn't mind waiting until the next day. He really wasn't hungry and that was okay. So...would you have let him eat the cupcake? How do you handle those situations where you don't want your child to feel different? Isn't his emotional health as important as his physical health? A couple months ago, we did tell Matthew to let us know if something is really important to him. On those occasions, we've agreed that if at all possible, we'll let him have "whatever" as long as he doesn't abuse that privilege. But if this had been one of those times, oh it would have been really hard to let him eat a cupcake with a BG that high! Last week I hosted my first giveaway....which I now realize excluded many of you who are not using Omnipod. Honestly, I didn't even think about that. I'll have to do another giveaway that includes everyone. And I will! But the Bands4Life are so awesome with the pod that I just had to share with you. Enough of that.....who's the winner? Misty from God is Good! On another note, the Tuesday Tip of the Day will return next week. I have a FANTASTIC storage tip for strawberries. They will last for at least a week. Next month marks 2 years since Matthew was diagnosed with Type 1 Diabetes. One of the benefits of being a "seasoned" D-Mom is that I've discovered lots of things that make our life easier. Today I'm giving away one of our favorite discoveries: A band of your choice from Bands4Life! They're fantastic little wraps designed specifically for the Omnipod Insulin Pump. It's certainly one way to jazz up the look of the pod, but this band is about much more than looks. Matthew likes to wear his while swimming and he especially loves it during sports because it really helps with the jiggle factor! Bands4Life has lots of patterns to choose from and they have bands for every area--even the tummy. They also sell ID bracelets. Hop over and check them out! They even donate a portion of all sales to the JDRF! Woo Hoo! One lucky reader will win their choice of band from Bands For Life. Blog about this giveaway including a link to this post. Post about the giveaway on Facebook including a link to this post. Tweet about this giveaway including a link to this post. Entry deadline February 12, 2012. I will be using Random.org to generate the winner. In honor of Valentine's Day, I'll be hosting my first giveaway tomorrow. Because I love all my Bloggy Friends! I won't tell you what it is yet, but Matthew says it's "useful and cool." If you haven't heard of Swagbucks, then today is the day to change that. It's a great and easy way to earn free gift cards! Swagbucks is basically a search engine like Google, but you earn "bucks" that you can redeem for all sorts of prizes. You can also do a daily poll or various little surveys to earn "bucks." They even have coupons that you can print off and you'll be awarded "bucks" when you redeem them at the store. It really takes up very little of my time, but it's totally worth it. Personally, I love getting the $5 Amazon Gift Cards. I can usually earn at least one card a month (sometimes 2) and that $$$ adds up fast. It really comes in handy when I'm running short on test strips and then it's like getting the test strips for free! You can't beat that. But of course, you can use your "bucks" however you want. They have all sorts of gift cards and prizes to choose from. Take a few minutes and check it out. It only take a few moments to sign up and then you'll be on your way to earning a little extra money. Can I Get Off this Roller Coaster? Here's how the past couple days have gone for us. Friday Night: Matthew dropped again. Saturday Night: Steady Eddie returned. But this time he was in the 240s because I was afraid to correct. (Can you blame me?!) The night before, Kevin had given him a full juice box because he kept dropping. Finally at 2am, I did do tiny correction, but it just kept him steady. So I guess he was really rising since he resisted the correction. Last night was even worse with a rise, BUT that does give me a 2 day pattern. When he's like this, it's so hard to know what to do! I think I've mentioned before that there's no nurse at Matthew's school. There is a teacher who has a daughter with Type 1 and she has graciously acted as his "school nurse since Matthew was diagnosed. Nearly 2 years ago! But for the past several months, we've been working to transfer responsibility over to Matthew. The teacher is there if he needs her and he can always call me, but basically he's on his own for lunch. Earlier this week, Matthew said he felt low in English (right before lunch) so he took a tab. By the time he got to lunch, he still felt low and sure enough, he was 61. He said he took another tab AND deducted 5 carbs from his lunch meal....just to make sure he wouldn't go low on the playground after lunch. Couldn't have done it better myself! I'm really proud of the way Matthew is gradually moving in the right direction. Sometimes it's so hard to let go and trust him to take care of himself. I worry about him making mistakes (because I've made a lot!) but I know the only way he's going to learn is to gradually let go. This is the part of being a D-Mom that really stinks. If you're a "nutrition label reading geek" like me, then this won't be news to you, but perhaps it will help a few people. Did you know that cheese is not always carb-free? When we were trained on how to care for Matthew, we were taught that cheese is always considered a free food. For a long time the Kraft Single Slice cheese has had one carb, which is probably not a big deal for your kid. BUT....recently I've noticed that the carb count has gone up to 2. I'm guessing they've added more milk. Again, 2 carbs isn't a big deal if your child is just having one slice. But if they're hungry and decide to grab a few slices since they're "free"....be careful. Those 2 carbs will add up quickly and that could make a big difference in the BG later! Because I wear contact lens, I'm very picky about my eye makeup remover. I also tend to be....ahem...cheap. But most of the inexpensive removers leave a greasy film on your eye that is quite nasty when you wear contacts. 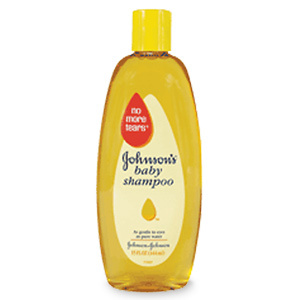 So.....Johnson's Baby Shampoo to the rescue! This stuff is fantastic for removing makeup! It doesn't burn or sting. It doesn't leave that yucky residue. And it even works on waterproof makeup! One important note: Make sure you wash with warm water. This little tip doesn't work with cold water. Oh! And if you're wondering how I discovered this trick....my fabulous mom gave me the secret years ago. My sweet Bloggy Friend, Wendy from Candy Hearts, wrote an amazing post about the power of insulin. She also gives you a glimpse into the mind of every D-Mom and the decisions that are made on a daily basis. Last week I wrote about some changes I was making to Matthew's basal rate. Guess what? It didn't work. That kiddo is still rising like crazy, starting around 9pm. I actually grabbed that PDM and double checked to make sure I programmed it right. I didn't accidentally lower the basal did I? Anyway, we've had several nights of correction after correction that just isn't working even though I upped another basal segment on Sunday. Hmmmm.....I see more basal changes (and sleepless nights) in my future. On the bright side, Matthew is going through one terrific growth spurt. We're talking HUGE! If you're a D-Mom (or Dad! ), today's tip is just for you. I've heard of people fumbling with flashlights, meters, and alcohol wipes in the middle of the night. First of all....skip the wipes! Simply have your child wash their hands right before bed. Easy breezy! And if you haven't already--- install a dimmer switch in your kiddos room. It's so much easier than fumbling with a flashlight at 2 o'clock in the morning! I have a confession to make: As a D-Mom, I love talking about basals. For those of you that don't know, the basal insulin is basically your "background" insulin. It's the insulin needed just to keep your body alive. Then whenever Matthew eats, he has to take more insulin to cover the carbs. That's called the bolus. So anyhoo....I think it's fun to see what other people's rates are. I feel a bit like a "Peeping Tom" but it's so interesting to me! Just last week, the fabulous Penny from A Sweet Grace posted Grace's basal rates. What a GREAT post! I'm thinking of all this because we're finally upping the basal tonight. Matthew has been "Random Man" for weeks. Months! We finally got a 4-day pattern, where he's high at 2am....so I'm upping the 12a-2a segment. For all those who are curious like me, here is his current basal rate. He's 11 years old and weighs about 85 pounds. Many diabetics have a higher rate in the early morning hours, but Matthew has always needed more during the 8-10pm time slot. Wow. I remember when he was 1-45. But you need what you need. Now....anyone else game for sharing their basal?? Today kicks off what I'm calling the "Tip of the Day." Each Tuesday I'll share some helpful tips that I've learned over the years. Sometimes it will be diabetes-related. Sometimes not. Instead, let's head to the kitchen and talk about food storage. Do you know the best way to store celery? Take the unwashed celery, wrap it in aluminum foil, and keep it in the fridge. COMPLETELY surround the celery with the foil so that NO celery is exposed. It will last for a LONG time! And you probably know that wilted celery can spring back to life quickly. Just cut off the ends and stand it up in a glass of water. Now go make a salad for dinner! If you don't know the name Tony Cervati , then today is the day to change that. He's an amazing biker and a huge influence in the Type 1 community. He is Type 1 Rider. Every day Tony shows that it's possible to THRIVE with Type 1. He's very open about his diabetes. Always posting his BG on Facebook. The highs, the lows and everything in-between. Sometimes I'll share that with Matthew and I think it's helping him to realize that his BG number is just information. Correct or treat and move on. One last thing that I really like about Tony? He's simply a nice guy. Tony has over 3,000 friends on Facebook, but when Matthew sent him a question--- Tony actually responded. And not a 2-word answer. He really answered Matthew's question. A few months later, I had a question. Again, Tony gave me the most thoughtful and encouraging response. But here's the exciting part! Tony is about to embark on an amazing bike journey that you won't want to miss. It's a documentary project entitled "Type1Rider: The Film." Here is a GREAT video that's sure to inspire you. Please take a few minutes and watch! Matthew loved it!! type 1 rider from Taproot Films on Vimeo. You can also read more about his adventure here. Go Tony!! And thank you for being a hero! One of the most frustrating parts of Type 1 Diabetes is that so many people do not understand. EXAMPLE: The Biggest Loser Dr.Huizenga. Sometimes he disappoints me so much! He continually tells us how he has cured diabetes. Give me a break! Diet and exercise can change Type 2 Diabetes, but there is NO cure for Type 1 Diabetes. Every time he lumps "diabetes" together as one group, he hurts those who have Type 1. Justice called me. Sub teacher told him he CANNOT eat a brownie, he has diabetes. His mother should call a nutritionist, its not acceptable. Momma fuming. Principal. Went to classroom to tell her that's NOT true or ok and she says "I am a dietician this isn't right!". I am livid." TRUTH: People with Type 1 can eat anything. There are NO diet restrictions with Type 1. People with Type 1 simply need to take insulin. Matthew does not have to avoid sugar. In fact, sugar often saves his life. But there is NO cure for Type 1 Diabetes. It has nothing to do with the food Matthew eats or doesn't eat. He has Type 1 Diabetes because his pancreas doesn't work. MY HOPE: The Biggest Loser talks about the desire to "Educate America" about obesity and issues related to that. I wish that Dr. H would take that role seriously and offer the TRUTH to America. If he doesn't, then clearly, he's the Biggest Loser. One last note: Please know that I don't get frustrated by the average person who doesn't know the difference. When Matthew was diagnosed, I didn't understand the difference either. What frustrates me is when people in the medical field are spreading incorrect information. That is inexcusable! I have a confession to make: I really don't pray for a cure. Oh sure, I've tossed up a quick prayer here and there, but it's not a big focus for me. Thinking about a cure distracts me from living life today. In fact, I don't even like for people to talk about a cure. (Gasp!) It's like planning on winning the lottery one day. Who can live that way? Yes, I would LOVE it if there was a cure for Type 1 Diabetes. I would LOVE it if Matthew didn't have count carbs at every meal. Change the pod every 3 days. Prick his finger and test his BG 10 times a day. It would be FANTASTIC if we didn't have to worry about lows. Or highs. Or....complications later in life. But truthfully, my biggest prayer is that he'll always have access to insulin. What if he doesn't have it one day? No one can live without insulin! And DKA can happen so fast. A cure would be a huge blessing, but in the meantime, I will be thankful for insulin. Our sweet dog turns 14 today! Isn't she a cutie? Just before Matthew was diagnosed with diabetes (about 2 years ago) she got very sick and we didn't think she'd make it. Today she's happy, playful and doesn't take any medication at all. However, she does tend to fall asleep. On anything. 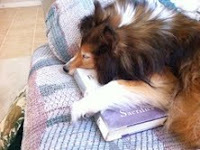 I took this picture when I realized she fell asleep on my library book! She's goofy and we love her so much! I know the DOC likes to refer to SWAGGING a lot. But truthfully, as a mom, I really don't feel comfortable saying "swagging" to my son. Our family has a different take on SWAG. We choose to think "Seeking Wisdom And God." I like that SWAG much better! First up, I know this post will cause some controversy and that is the last thing I want to do. PLEASE DO NOT GET MAD AT ME. We all have different opinions on how to handle diabetes and I'm hesitantly tossing my thoughts out there. Yes! It would be GREAT if every restaurant provided nutritional information, but at the end of the day, we should be able to guess the carbs in food. And we need to teach our kids to do the same. Because you can't rely on nutrition information. Every cook will dish up a different amount of food. And what about when you go to a friends house for dinner, or a school party, or a church potluck? I wouldn't hold my breath for carbs counts. As parents, it's our job to know the food we allow our children to eat. At least be able to make a good guess without relying on nutrition information. And for goodness sakes! Make sure you check BG 2 hours after eating, because odds are you didn't get it just right. But I bet you'll be closer next time! Matthew is such a boy. He wants to play, have fun, and think about diabetes as little as possible. I get that. And I try to not let it bother me. Especially since he's great about paying attention to how he feels and catches his lows. But whenever he's at a friend's house and they're having a snack, he'll always call and ask me what to do. I would love for him to take a more "active" role in his diabetes, but again, I try not to let it bother me. At least he's calling for help, right? Well yesterday, he made HUGE progress. He was at a friend's house and called, but this time it was different. "Mom, we're having popcorn. We measured out 2 cups and I already bolused for 8 carbs. But I didn't check my sugar, because it's only been a couple hours since lunch. Did I do that right?" I was completely floored. "Yes, honey. You did it just right. Good job!" Now that's the way to start a New Year! So...I thought I would introduce you to a new D-Mom. Well....she's not really new, but she's new to blogging. Susie is writing at Through Diabetes and Beyond. Perhaps you read her daughter's blog? Jess is a 16-year-old type 1 who writes at Faith Injected. If you don't know them, then goodness! Pop over and say hi. They are both fabulous! And selfishly, I'm really excited to read about diabetes from both points of view. Sometimes diabetes can be such a lonely road....its always a blessing to meet others on this journey.